This tour combines an unforgettable way to explore inland Dunedin by railway and also visit the stunning Otago Peninsula. 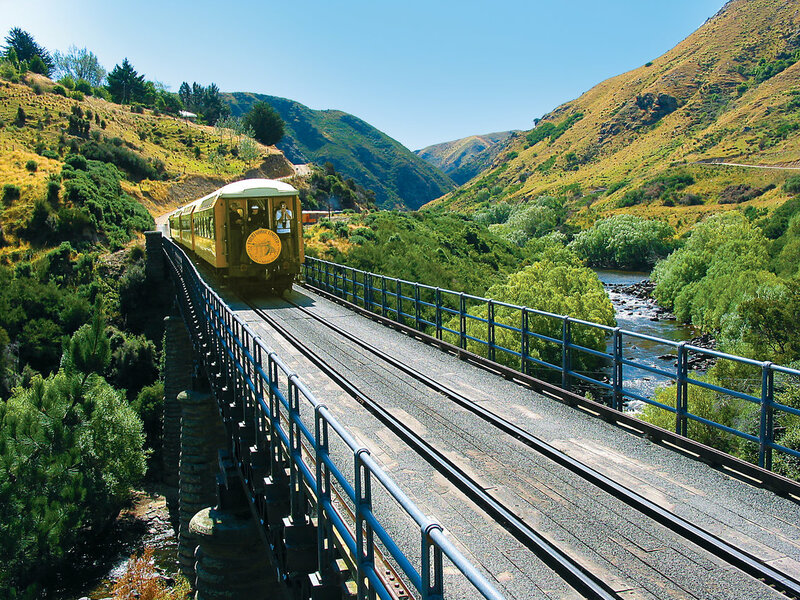 The Taieri Gorge Railway provides a look at the vast landscape of Dunedin with spectacular views as you travel through narrow tunnels, along sharp curves, over deep ravines and through the Taieri River Gorge. The second half of the day continues with an exploration of Otago Peninsula’s rugged coastline, opportunity for rare wildlife sightings and some of the best photo opportunities. Please note: Lunch is not included however we can provide a gourmet ‘picnic lunch’ on request, it includes a ham sandwich, packet of chips, piece of fruit, muslei bar and juice. Alternatively, there is a buffet cart onboard with a good selection of sandwiches, pies, sausage rolls etc. Gayle692: "They go above and beyond your expectations". Gill G: "Commentary and information very good, excellent value for money!" marshalnk: "We are looking forward to another adventure with Back to Nature Tours. They are excellent!" Dunedin was once the leading industrial and commercial centre of New Zealand and has retained many of its early buildings, and the Dunedin Railway Station is no exception! After being collected by your Back to Nature guide you’ll be taken to the iconic Station, built in 1906, where you’ll have time to enjoy this architectural masterpiece before you board the train. Travelling in a historic wooden train carriage, you’ll follow the course of the Taieri river, climbing towards the Taieri Gorge. The railway winds through almost a dozen tunnels and passes over several viaducts before arriving at Pukerangi where you can stretch your legs and enjoy magnificent views of the surrounding countryside. A visit to Dunedin is not complete without a trip on the Taieri Gorge Railway - one of the world's great train trips. The train trip is approximately 4 hours. The tour now shifts focus from inland Dunedin to the rugged and stunning Otago Peninsula where you’ll spend the rest of the afternoon. For all you photographers out there, you’ll want your camera on the ready because this stretch of coast is a photographers dream! We’ll visit remote parts of the Peninsula and make several stops to capture the postcard worthy views and flora and fauna that dot this coast. Heading out on the high road towards Portobello, the main township on the Otago Peninsula, glimpse stunning harbour views passing early drystone dyke walls and limekilns as we go, reminiscing on an early industry in this region. We’ll make our descent into the Tidal Inlets - a birdwatchers paradise - though, all will appreciate the history and important ecosystem. From this scenic position, kingfishers, herons and many other waders and waterfowl can be seen. But as your guide will remark, it’s often the things you can’t see that have the greatest influence on this ecosystem’s function. From our furthest stop on the Otago Peninsula, we’ll take a short walk to a wildlife reserve to spend some time looking for the rarest sea-lion in the world - the NZ sea-lion and NZ fur seals! Looking around, admire one of the Otago Peninsula’s most stunning beaches with amazing basalt rock formations that can be seen up close. And why not? Take off your shoes and feel the sand between your toes! We’ll return to the city via the low road, weaving in and out of bays, through villages and communities before arriving back at Port Chalmers with plenty of time to spare.